“He was the greatest Nishnaabe I ever knew,” are the words which Stan used to describe Michael Nindaba, the man who raised and loved him from the time that Stan turned six years old through to the end of Michael’s life. Referring to him as “the Old Man,” Stan acknowledged the many gifts which Michael passed on to him. Stan was raised in the bush, where living off the land and understanding the relationships within the network of life were everyday activities. Stan had a profound appreciation for the importance of living as a Nishnaabe; every part of his life, every interaction, and every relationship embodied his Nishnaabe values. Stan’s gratitude for his elders was expressed by him continuously; he acknowledged their wisdom and their life lessons earned and learned throughout the many generations told of in their stories. He was particularly grateful to Michael for raising him inside of Nishnaabemwin. Their interactions with each other, occurring in Nishnaabemwin, provided Stan with solid foundations which enabled him to experience the world through the eyes of our language. Stan often shared that the world which the English language describes is quite different indeed from the world as experienced through Nishnaabemwin. Stan had a profound respect and admiration for our language, especially after his experiences in Residential School and the attempts of the government to steal his language from him. He understood quite well what the attempts to remove our Nishnaabe world view and ways of being by removing our language meant in the bigger picture. For Stan, understanding and speaking Nishnaabemwin is fundamental to living in this world as a Nishnaabe person. 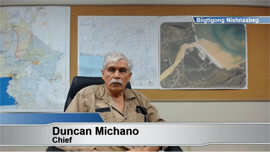 In 2013, Biigtigong’s Language Project team approached Stan for guidance and direction. Since that time, he made himself available and was committed to helping out in any way he could. Stan, many times, said that the work in front of us was going to be extremely difficult and that great challenges would come before us. However, with hard work and a strong desire, these challenges could be overcome – but it was not going to be easy. He provided encouragement and believed that creating speakers of Nishnaabemwin is a key element to ensuring our Nishnaabe world remains alive. Stan was also an advocate for education from the western world. He himself embraced western education and attained his certification as an electrician. Stan’s identity as a Nishnaabe man was strong and as such it provided him with the tools necessary to live in the modern world. He emphasized the importance of one’s knowing who they are as a key to living a good life. His western education provided him the means to make a living and make contributions to the world, but it was his Nishnaabe education that provided his foundations.